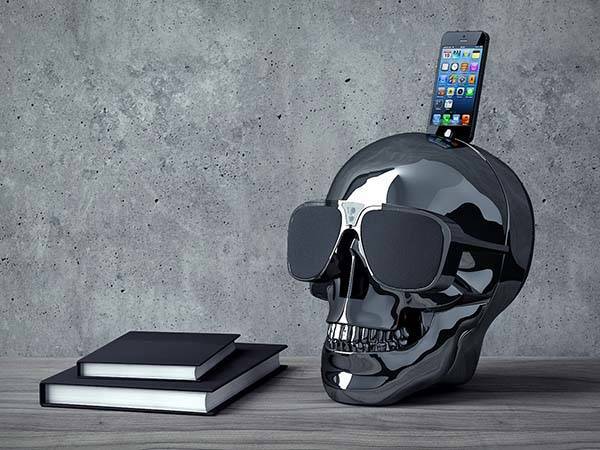 The fancy skull-shaped Bluetooth speaker not only delivers stereo audio in a pretty cool way, but also charges your iPhone or iPod with an integrated iPhone dock. Like the design? Let’s go on for AeroSkull HD+ dock speaker. The AeroSkull HD+ is an eye-catching and versatile Bluetooth speaker that measures 35 x 35 x 35 inches. 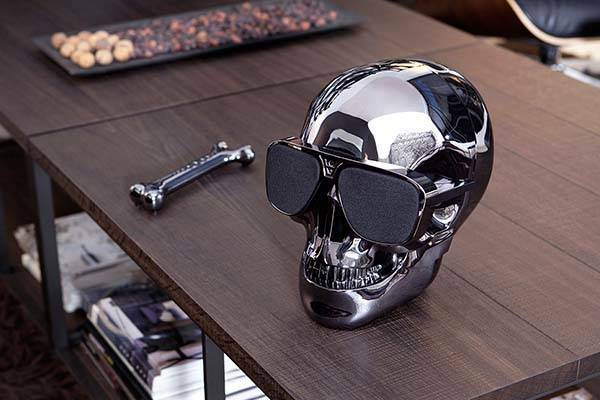 As we can see from the images, the dock speaker is shaped as a human skull along with accurate contours and meticulous detailing, while glossy coating, multiple optional colors and the sunglasses-like speaker grills add much fashionable aesthetic to the acoustic skull. The Bluetooth speaker comes equipped with two 48mm 30W mid-range drivers and one 92mm 60W subwoofer plus aptX and A2DP codecs in order to stream high-quality stereo audio from your smartphone or tablet, and an extra 3.5mm audio input allows it to work with any music player with a 3.5mm audio jack. Furthermore, the Bluetooth speaker also features an integrated iPhone dock. With its built-in Lightning connector, you can dock your iPhone or iPod on the top of the fancy skull for audio playback or charging. In addition, the dock speaker also comes with a bone-shaped remote. The AeroSkull HD+ Bluetooth speaker is available in 7 colors, each will set you back €599 (approx US$667). If you’re interested, jump to Jarre Technologies for its more details. BTW, also don’t miss AeroSkull skull portable Bluetooth speaker and more related cool stuff by following tags.